This 4-inch long speaker wire to RCA cable is highly adaptable for custom hookups. It has an RCA jack on one end and tinned wire on the other to accept any connector. This speaker wire adapter cable allows high level speaker outputs to be connected via RCA phono jacks. 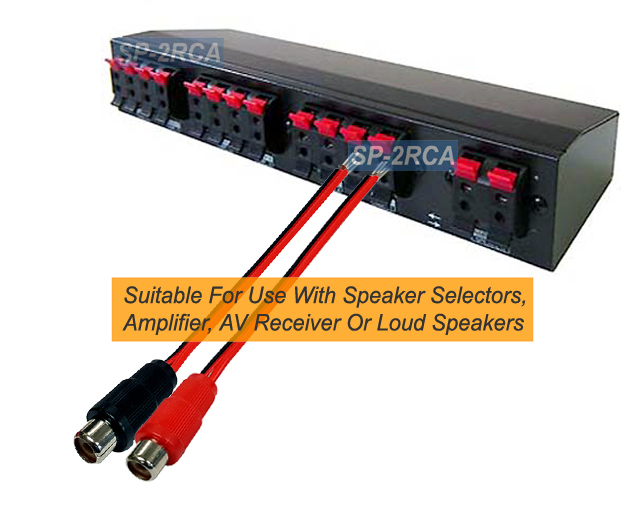 Ideal for use with amplifiers or audio receiver that have high level input capability but no speaker wire input connections or the molded RCA plugs are short to allow for easy installation in tight areas. This adapter cable is also suitable for turning any audio device containing speaker spring terminals into RCA connectors for installation. Converts 2 channels of speaker wire terminals to RCA jacks for installation.